When Fresh Air Went Out of Fashion at Hospitals! How the hospital went from luxury resort to windowless box. In the March 1942 issue of the journal Modern Hospital, Charles F. Neergaard, a prominent New York City hospital design consultant, published a layout for a hospital inpatient department that was so innovative he copyrighted it. The plan held two nursing units—groups of patient rooms overseen by a single nursing staff—in a single building wing. For each unit, a corridor provided access to a row of small patient rooms along a long exterior wall and to a shared service area between the two corridors. The feature that made his plan so innovative—and therefore risky? It included rooms that had no windows. A windowless room hardly seems daringly innovative nowadays, but in the 1940s it was a shocking proposal for a patient wing. It violated a long-lived understanding of what, exactly, the role of the hospital building should be in terms of promoting health. For nearly two centuries, hospital designers had based their layouts on a fundamental assumption: In order to remain disease-free and health-giving, hospital spaces required direct access to sunlight and fresh air. This rule was the product of a centuries-old belief that disease could be spread by, or perhaps even directly caused by, dark, stagnant spaces where bad air—smelly, vitiated, stagnant, particulate-laden air—accumulated. In the late 18th century, this correlation was statistically certain. Epidemics always hit the tenants of crowded, impoverished urban districts harder than the inhabitants of airier, wealthier neighborhoods. Patients in large urban hospitals suffered cross-infections and secondary infections far more frequently than patients in rural or small-town hospitals. It was common knowledge that if windowless rooms didn’t directly breed disease, they bred the conditions that led to disease. Given this correlation, before the 20th century, every single room within a hospital typically had access to the outdoors. Corridors had windows. Linen closets had windows. In some hospitals even the ventilation ducts and enclosures for plumbing pipes and risers had windows. Windows in patient rooms and operating rooms were so large that the glare caused problems—keeping patients awake and causing momentary blindness in surgeons during operations. Late 19th-century and early 20th-century advances in medical theories and practices altered, but did not erase, a faith in windows. With the development of germ theory, sunlight and fresh air had new purposes. Experiments proved that ultraviolet light was germicidal. So windows of clear glass, or even of special “vita-glass” that did not block the UV rays, were a means of surface decontamination. But surroundings were important, partly, because of who went to hospitals in the first place. Indeed, until the late 19th century, medical treatment was not the reason to go to a hospital—poverty was. The vast majority of 19th-century hospital patients were charity cases—sick people who could not afford a doctor’s house call, had no family to care for them, and had no place else to go. A patient would occupy the same bed in a hospital ward—which housed anywhere from half a dozen to 30 patients—for weeks, sometimes even months. The doctor made rounds once a day. Nurses provided food, changed bandages, cleaned, and changed linens—but provided very little in terms of hands-on treatment. The hospital’s scrupulously clean, bright, airy rooms were an environmental antidote to the tenement surroundings from which impoverished patients came. But the population of hospitals changed in the first decades of the 20th century. Medical advances, urban growth, and philanthropic transformations turned hospitals into a new kind of institution—where persons of all classes went to get cutting-edge treatment. Anesthesia and asepsis made hospital surgeries not only safer but also more bearable. New equipment like x-ray machines, ophthalmoscopes, and cardiographs improved diagnostic and therapeutic options. Bacteriological lab technicians could identify pathogens with a certainty undreamed of during the preceding era of symptomatic diagnosis. By the early 20th century, what happened in hospitals was increasingly about medical procedures and efficient workflow, not the ostensible healthiness of the environment in itself. These changes made the limitations of the earlier “therapeutic” hospital designs glaringly apparent. In order to provide a window in every room, buildings could not be wider than two rooms deep; this inevitably required multiple long narrow wings. Such rambling structures were expensive to build, prohibitively expensive to heat, light, and supply with water, and inefficient and labor-intensive to operate. Food reached the patients cold after being trucked from a distant central kitchen; patients requiring operations were wheeled through numerous buildings to the surgical suite. Hospital designers thus began to arrange practitioners, spaces, and equipment into a more effective layout. Catchwords changed from “light” and “air” to “efficiency” and “flexibility.” An emphasis on efficiency rapidly took over the utilitarian areas of the hospital; time and motion studies determined layouts and locations of kitchens, laundry, and central sterile supplies. Diagnostic and treatment spaces were re-designed to establish efficient, but aseptically safe, paths for the movement of patients, nurses, technicians, and supplies. But, initially, it left the design of inpatient departments unaltered. 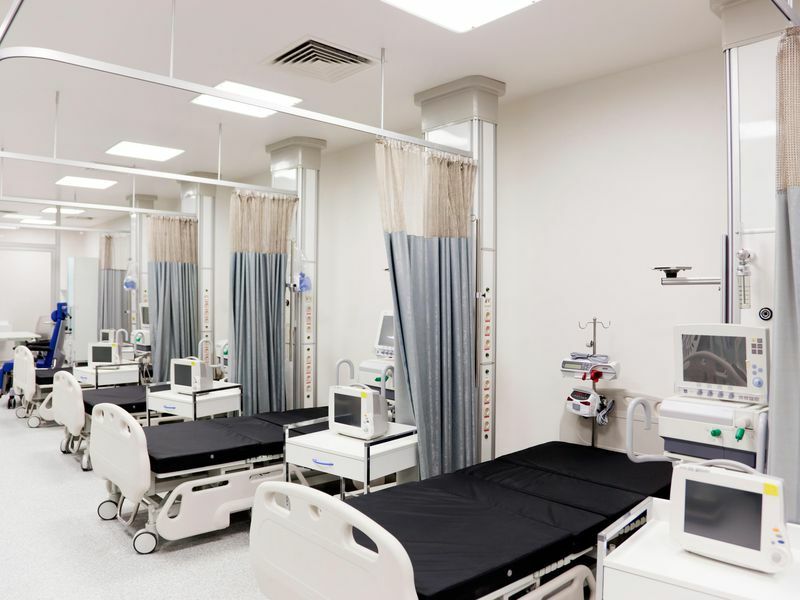 Hospital designers and practitioners worried that patient areas designed for efficiency, not healthiness, would prolong treatment, impede recovery, or even cause deaths. In a 1942 issue of Modern Hospital, Lt. Wilber C. McLin considered it “unthinkable even to consider the possibilities of applying time and motion studies to the methods of direct patient care.” Inpatient departments remained sacrosanct temples of light and air. This was the design dilemma that confronted Neergaard, an iconoclastic rising star in the brand-new profession of “hospital consultant” (doctors who advised building committees and architects on best practices). He proposed streamlining nursing unit design, keeping windows in the inviolable patient rooms, but prioritizing efficiency over direct access to sunlight and fresh air in the adjacent service rooms. His plan allowed two different nursing units (groups of patients overseen by one head nurse) to share the same windowless central service rooms, reducing spatial redundancy. Neergaard calculated that this “double pavilion plan” required only two-thirds of the floor area of a traditional nursing unit layout. It also moved the service rooms closer to the patient rooms, drastically reducing a nurse’s daily travels. His design was a first foray into treating the hospital as if it were any other building. The structure was a tool, facilitating the delivery of medical care, not a therapy in itself. Neergaard’s ideas, however, won out. Rising costs and decreasing revenue sources made reduction of hospital construction and operational budgets a fiscal imperative. Centralized design reduced the amount of expensive exterior wall construction, facilitated centralization of services, and minimized nurse staffing requirements by reducing travel distances. By the 1950s, with the advent of antibiotics and improved aseptic practices, the medical establishment also believed that patient healthiness could be maintained regardless of room design. Some doctors even preferred the total environmental control offered by air conditioning, central heating, and electric lighting. Windows were no longer necessary to healthy hospitals, and by the 1960s and 1970s even windowless patient rooms appeared. The efficient, inhuman, and monotonous buildings of the second half of the 20th century bear witness to the extent to which hospital design became a tool to facilitate medicine rather than a therapy in itself. Today, a stay in a hospital room is endured, not enjoyed. The pendulum, however, is still swinging. In 1984, hospital architect Roger Ulrich published an article that had one clear and influential finding: Patients in hospital rooms with windows improved at a faster rate and in greater percentage than did patients in windowless rooms.